There is an interesting paper from Julius LukeÅ¡ et al. 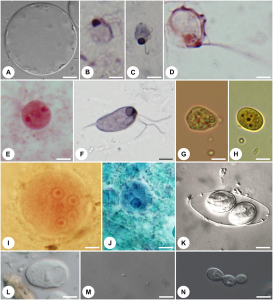 in PLOS Pathogens that is worth looking at for anyone who works on microbial diversity: PLOS Pathogens: Are Human Intestinal Eukaryotes Beneficial or Commensals? They basically argue (reasonably I think) that the roles of microbial eukaryotes in the human gut have been excessively interpreted as parasitic and that most are probably other types of symbioses. Calling intestinal eukaryotic microbes symbionts–which encompasses mutualists, commensals, and parasites–rather than parasites conveys the diverse interactions they have with hosts above and beyond pathogenicity.There is a need to change therapeutic strategies to target elimination only of demonstrably pathogenic species–the true parasites–from host organisms, while avoiding removal of the harmless or commensal species.Now is the right time to determine the diversity of eukaryotic microbes in the healthy human population using NGS and to disentangle their relationships with bacterial communities.Characterizing eukaryotic microbes will enable us to associate the occurrence or absence of various eukaryotic microbes with human diseases.With the aim to bring some of the “lost” intestinal eukaryotes back, controlled colonization by commensal eukaryotes in human volunteers should be performed to confirm the predicted positive impact on diversification of human gut microbiome.If successful, these trials should be followed by controlled infections of patients with, e.g., functional and organic gastrointestinal diseases with a goal to inform novel approaches in the treatment of such diseases.